THURSDAY APRIL 25TH 7-9 AT PWPL AND FRIDAY APRIL 26TH 12-2 AT HIAWATHA OFFICE. 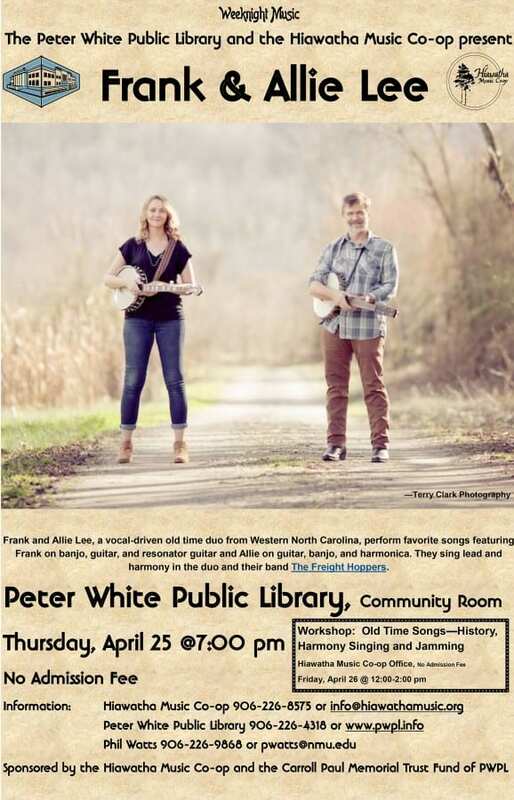 The Hiawatha Music Co-op and the Peter White Public Library invite music lovers to a Weeknight Music Concert with Frank and Allie Lee on Thursday, April 25 at 7:00 pm in the Library’s Community Room. In addition to the concert, the Hiawatha Music Co-op will host a workshop entitled Old Time Songs—History, Harmony Singing, and Jamming at their office at 1013 N. 3rdStreet # 9 on Friday, April 26 from 12:00-2:00 pm. Frank and Allie Lee, are a vocal-driven old time duo from Western North Carolina. Their music ranges from blues to bluegrass, yet remains rooted in the old time aesthetic. Frank’s nylon string fretless banjo is the dominant instrument with guitar, slide guitar, and Allie’s banjo and harmonica adding to the musical texture. As the core duo of the longstanding string band, The Freight Hoppers, Frank and Allie have traveled extensively as touring musicians. Frank, as a founding member of The Freight Hoppers, has impressed audiences all over the United States, Canada, and Northern Europe with his signature clawhammer sound. Allie, as founding member of The Whipstitch Sallies, a band from Indiana, has toured throughout the Midwest, North Carolina, Colorado, and Hawaii. Together, they spent a couple of weeks in France in May 2018, and are currently planning concerts around the country. There is no admission fee thanks to sponsorship by the Hiawatha Music Co-op and the Carroll Paul Memorial Trust Fund of the Peter White Public Library. For more information, contact the Library at www.pwpl.infoor call 226-4318, the Hiawatha Music Co-op at info@hiawathamusic.orgor 226-8575, or Phil Watts at pwatts@nmu.eduor 226-9868. ← White Water at March Hiawatha on Tap!